Some 30% of students – mainly females – suffer from excessive anxiety when confronted with the prospect of exams. The good news is that virtually all of them can be effectively helped. To find out how and where, read on. “Fear of exams can be overcome,” says Professor Anne Frenzel, Director of the Master’s Program “Psychology in the Learning Sciences” at the Department of Psychology. Most students are acquainted with the typical butterflies-in-tummy syndrome that sets in the run-up to an exam. But for many others the thought of facing a test evokes a pathological state of anxiety. Albert Einstein himself allegedly suffered from an abnormally intense fear of exams. In such cases, the candidate views the upcoming test as an insurmountable obstacle, even though this perception is at odds with her intellectual abilities and grasp of the relevant material. This misguided psychological perception may be accompanied by somatic symptoms, such as sudden panic attacks, heart palpitations and abrupt bouts of sweating. Many sufferers react by withdrawing from their normal routines. “I remained holed up at home for months, and had no contact at all with my circle of friends,” says Andreas Huber (a pseudonym), a former student of Political Science at LMU. He even kept his parents at arm’s length, in order to avoid embarrassing questions on their part. For a long time he convinced himself that he could somehow cope with the situation. “And when I finally admitted to myself that I needed help, it was almost too late,” he recalls – a not untypical case. Only when under threat of expulsion did Andreas look for counseling services on the Internet, and discovered the Psychotherapeutic and Psychosocial Advisory Service (PPAS) run by the Munich Students Union (Studentenwerk). The staff there helped him out in two ways – first by drawing his attention to appropriate study materials that he could use to prepare for his exams, and secondly by teaching him relaxation methods, such as breathing exercises, which enabled him to concentrate for longer periods. The PPAS also offers courses in autogenic training, progressive muscle relaxation, qigong and yoga. “They also explained how best to organize my time, so that I could remain focused on my exam preparations,” Andreas says. – And he consulted a psychotherapist. “Fear of exams is the principal reason why students drop out before completing their degrees,” says Anima von Nostitz, a psychoanalyst at the PPAS in Munich’s Olympic Village. It ranks ahead of factors such as procrastination and illness. These students always assume the worst. They conjure up disaster scenarios and refuse to consider the possibility of a more favorable outcome. Yet self-doubt and fear of failure can be alleviated by personal coaching and by instilling the candidate with a more positive attitude. Behavioral therapies like this have a success rate of around 97%, but it is often difficult to convince victims of test anxiety that their fears can be effectively allayed. “Many are too embarrassed to seek help for their psychological problems,” von Nostitz says. Nowadays, however, supervision and coaching measures are a normal part of job training. – And those who make use of them soon realize that they are not alone. A little stage fright is a good thing, as the surge of adrenalin in the blood improves performance. “Fear of failure can provide a strong motivation to make a determined effort to succeed,” says Professor Reinhard Pekrun of the Faculty of Psychology and Educational Sciences at LMU. Psychologists refer to this as extrinsic motivation. Anxiety, on the other hand, compromises intrinsic motivation by reducing confidence in one’s own working memory, and diminishes attention span. Long-term studies of test anxiety carried out at American universities, and by LMU researchers, point to the baleful influence of a self-amplifying psychological effect: “Fear of exams increases the likelihood of failure, and failure undermines self-confidence and thus intensifies anxiety,” Pekrun explains. The victim is trapped in a vicious circle. According to surveys carried out by insurance providers, some 50% of Germans suffer from stress. For students the corresponding figure is 53%, but around half of these complain of stress levels that can no longer be controlled by everyday coping strategies. Moreover, 40% of students over 27 fall into the latter category, irrespective of whether or not they work part-time while studying or failed to complete courses within the prescribed period. In one survey, 62% of ongoing veterinarians stated that they suffered from high degrees of stress – a precursor of test anxiety – as did 59% of nutritionists, 58% of IT students and 51% of medical students. Students of Law (45%), Medicine and Economics (20%) referred specifically to the pressure of competition in their respective disciplines. Experts point to the urgent need for students to receive more instruction in the art of time management, as inappropriate approaches to learning increase levels of stress. Three daily 10-hour sessions in succession are less effective than devoting 1 hour per day to the task for three weeks. Indeed, PD Dr. Matthias Angstwurm (Faculty of Medicine) believes that students’ self-assessments are often unrealistic. He recently carried out a systematic investigation of cognitive test anxiety. One-third of the medical students interviewed admitted that they had taken at least one exam for which they were ill-prepared – with predictably disappointing results. “Higher levels of anxiety prior to the next test are the logical consequence.” To enable them to objectively gauge their actual levels of proficiency, students need more feedback. This could be provided by the use of mock exams or frequent formative integrated evaluations of one’s current level of knowledge. Based on his surveys of medical students at LMU, Angstwurm estimates that between 40 and 50% of them – at all stages of their training – experience test anxiety. The minimum figure for the university as a whole is 30%. Notably, the differences between students of Medicine, Economics, Natural Sciences, Languages and the Humanities in this respect are “marginal”, he says. The spread between the figures for different subjects is essentially accounted for by the gender factor. “The incidence of test anxiety among women is significantly higher than it is for men,” Angstwurm explains, and he feels strongly that this topic deserves much more intensive study. If certain students fail to make optimal use of their talents for social, financial or cognitive reasons, this will “significantly affect” their career development potential and reduce their chances of personal and professional success. “And that has obvious implications for the future of our society,” Angstwurm adds. Professor Michael Meyer, Dean of Studies at the Faculty of Medicine at LMU, advises all students who find it particularly difficult to cope with the stress of exams to seek professional help. “I also recommend that they consider taking part in the student-led preparatory tutorials available.” In order to optimize time management “given the increasing complexity of daily life”, the Faculty also offers help in designing an optimized study schedule. “The geographical distribution of our various facilities makes many things more difficult than they might otherwise be,” Meyer admits. In the case of Medicine, these are dispersed between Freimann in the northeast and Martinsried to the southwest of the city. Academic Counselor Robin Eisenreich has observed that the incidence of test anxiety, writer’s block and work overload has also risen among students of Sociology and Political Science. For the Faculty of Business Administration, these phenomena have become almost routine. Student advisor Dr. Eva Groher attributes this mainly to the clustering of exams and the comparatively strict deadlines. “Many of our students also demand too much of themselves,” she adds. For this reason, the Faculty set up a comprehensive Counseling and Coaching Service a few years ago. As a rule, those who consult Groher and her colleague Dr. Christiane Romeo talk about their problems in connection with stress and anxiety over upcoming exams. “But quite often, they mention other aspects of their personal lives, which impinge on their university studies,” Romeo says. In their experience, both she and Groher say, students are generally less averse than other groups to speak openly about psychiatric illnesses. In such cases, the two do their best in regular one-to-one consultations to assist their charges to confront their difficulties and complete their studies. In the Faculty of Law, anxiety and stress has always been focused on the two State Examinations that all budding jurists must undergo. The first of these consists of six, and the second of eight, separate written tests, which together cover huge amounts of material and must be taken within a relatively short period of time. “The form of the examination makes severe physical, emotional and psychological demands on candidates and can lead to anxiety overload,” says Professor Susanne Lepsius, Dean of Studies in the Faculty of Law. To help students to meet these challenges, the Faculty has designed a series of tutorials in which course materials are reviewed in a structured manner. In addition to serving as a refresher course, this reassures candidates that they have made adequate preparations for the exams and are in a position to recall and apply their knowledge methodically during the tests. The tutorial therefore helps to nip fears of failure in the bud. According those directly concerned with setting the tests, the tutorial has significantly reduced the incidence of test anxiety over the past several years. The reform of the curriculum has also played a positive role. Since 2002, the final grade is determined to 30% by the candidate’s performance in a self-selected subject area. “This means that the grade achieved in the State Exams is not quite as crucial as it once was,” Lepsius points out. 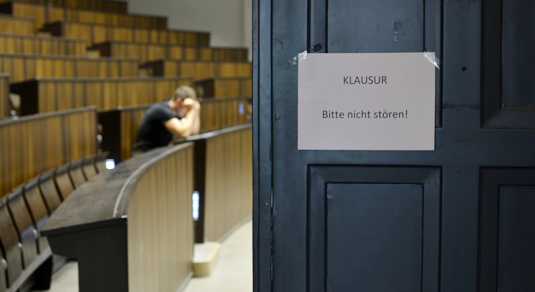 The student chaplains who provide pastoral care for the Protestant Student Community (Evangelische Studentengemeinde, ESG) also advise those who find exams psychologically taxing – regardless of the students’ religious affiliations. University Chaplain Martina Rogler first attempts to identify the root of the problem. Is it linked to the course content, the nature of the subject itself or the demands made by university studies per se? The clearer the definition of the problem, the less threatening it becomes. Usually, examinations can be repeated or failures can be compensated for by improved performance in the following semester. “But I emphasize that one’s true worth encompasses far more than academic successes, and does not depend on exam results,” says Rogler. This insight itself can give one the sense of composure needed to approach exams in the right frame of mind. And if everything really does depend on one last test, she calls on the expertise of a learning coach, who provides detailed study and revision schedules for the anxious examinee. ESG chaplain Dr. Friedemann Steck deals mainly with students from abroad. “Muslim students are more likely to speak of their religion as a source of tranquility and motivation than others,” he says. Nevertheless, when a forced termination of their studies would also mean a premature return home, they too often seek his help. As Steck emphasizes, “written exams, and more especially oral exams, always confront international students with the language issue.” However, thanks to an ecumenical emergency fund set up by the Protestant Church and its Social Service in Bavaria, he can apply for financial assistance for students from countries outside the EU – provided that they are facing an imminent examination and find themselves in financial straits. The Catholic University Community also opened a non-denominational Psychological Counseling Service (PCS) in 2015. Towards the end of each semester, there is a notable increase in the number of inquiries it receives and, in cooperation with the Studentenwerk, it holds a workshop on stress management in June every year. LMU‘s Career Service (Student und Arbeitsmarkt) organizes similar workshops. When the first signs of stress appear, “simple measures”, such as cutting down the amount of time spent on social media and computer games can suffice to improve concentration, says psychologist Dr. Maria Miller of the PCS. She also points outs that one can effectively combat stress by getting together with friends, engaging in sporting activities, and relaxing every now and again – even at the height of the examination season.